A forced-a ir furnace is the most common type of heating system in Wisconsin. Forced-air furnaces can be powered by natural gas, liquid propane, fuel oil, or electricity. They work by circulating warmed air through duct systems—which directs air to various rooms in your home. Typically, the air is moved by a powerful fan located inside the heating unit. 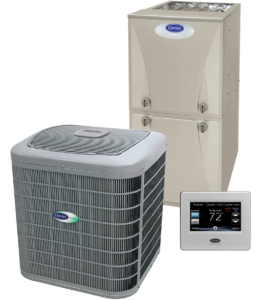 Forced-air systems are easily identified by their visible registers—located on floors, ceilings or walls—which blow warm air into your home or draw cool air back into the furnace for re-heating. If you’re in the market for a new forced-air furnace, buy a unit that is at least 90 percent AFUE* efficient and uses a variable speed motor. Focus on Energy also recommends having the furnace modulate, or stage the heat output for additional savings. This type of furnace will save on natural gas as well as electricity, which is needed to drive the furnace fan.